East Singapore. 128 Meyer Road, near The Makena Condos. Expat families who want low density, spacious bedrooms, garden and reasonable rent. Completed: Around 1986. 35 maisonettes, 1 studio (650 sq ft). Nanak Mansions (left, low rise building with purplish roof tiles). 4-storey buildings with garden spaces. 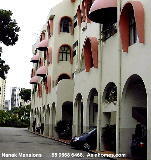 Each Maisonette is 2 levels and therefore there are 2 maisonettes - one upper and one lower maisonettes. 1 walk-up 4th floor studio is available for rent. 3rd and 4th storey. Corner units are 3600 sq. ft.
Intermediate units are 2700 sq. ft.
On 4th storey, there is a balcony off Bedroom 2 & 3. Master bedroom has no balcony. Solar heaters on roof saves the tenant on some electricity bills. Lower maisonettes. 4+1 with car parking lot. lst and 2nd storey. Corner units are 3200 - 3400 sq. ft.
Intermediate units average 2600 sq. ft.
On 2nd storey, there is a balcony off Bedroom 2. Open Terrace off Bedroom 4. Master bedroom has no balcony. There is a small back balcony from the kitchen and direct access to the open field. Appeals to expatriates with children, wants a big spacious low rise "house" over 3000 sq. 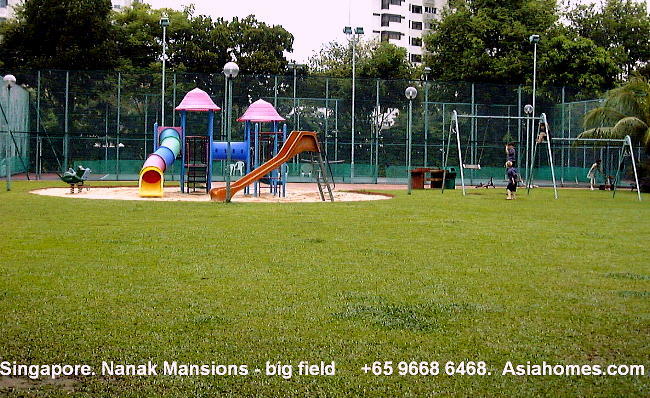 ft, plenty of green grassland for the children to run about safely, a pool at an affordable rent. 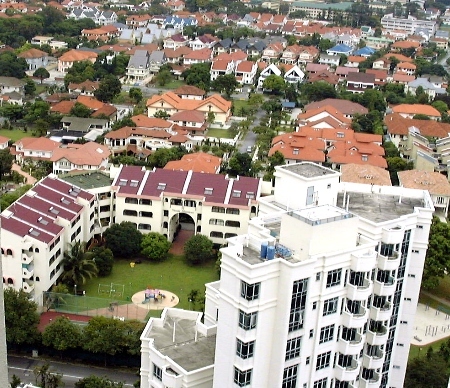 In 2011, there is a very high occupancy rate as there is an acute shortfall of such garden-landed condos and a large increase in expatriates coming to Singapore. Facilities Swimming pool. Children's pool. Tennis Court. Badminton Court. Basketball post. Gymnasium. Children's playground. Big open field is well used by the young children. Covered assigned car park, no need to fight over car parking lots. Full time experienced & friendly manager to handle all tenant's problems. Reasonable rent on a per sq. ft basis. Huge built-in areas. 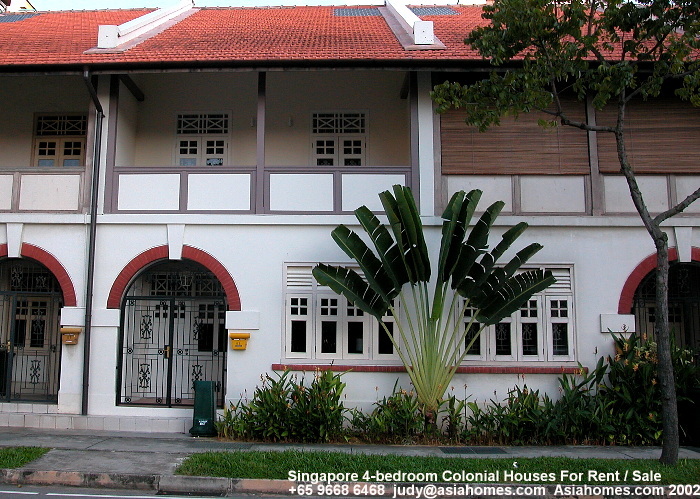 Near Katong Shopping Centre, Parkway Parade Malls, supermarkets and other eateries. A provision shop nearby providing home delivery. Not as new as the other condos along Meyer Road when you compare the flooring and the swimming pool or gym, but the rent is reasonably affordable for expats with big families or need storage spaces. Big units with big open fields at reasonable rents are rare in Singapore's East Coast but they are more dated. No elevator to the upper maisonettes which are on the 3rd and 4th level. Rent depends on whether the units have been upgraded. Varies from $6,200 to $8,200. 1. Lower Maisonette 4-bedroom, 2600 sq ft, with garden $8,200. Ground floor units are in great demand and therefore commands a premium rent. 2. Upper Maisonette 5-bedroom:, 2700 sq ft $6,200. The landlord will not renovate again. Therefore the rental is $6,200. 3. Studio, 1300 sq ft $3,500. 1-bedroom + 1 utility room with 2 toilets. Walk up to the 4th floor. No lift or elevator in Nanak Mansions. Rental includes utilities and basic cable TV channels. There are few vacant units as demand for over 3000 sq. ft low rise buildings in the East Coast exceeds supply. Expats who want spacious, affordable apartments with pool, tennis court and gym, low rise and low density condos like Nanak Mansions, e-mail judy@asiahomes.com Tel: +65 9668 6468. If you want to rent your unit faster, insert "Owner" in your Straits Times Classified as realtors prefer not to co-broke (share commissions) with the other realtors advertising on behalf of the Landlords.